This spring saw the first concerts in our new series, the Young Artists’ Platform. From September, in conjunction with the Northamptonshire Music and Performing Arts Trust, we will hold a concert on the first Saturday of every month, offering a platform to the most talented young musicians in the area. We were delighted to start the series off with some home-grown stars! Scholar, NATHAN LAM. Performing works by Bach and Mendelssohn alongside contemporary works by David Bednall and Alan Spedding, Nathan’s recital drew large crowds, with standing room only as they filled the pews! Nathan began his musical education as a violinist before taking up the piano at the age of eleven, and the organ a year later. At 15 he was appointed Organ Scholar at All Saints, where he continues to accompany and direct the seven weekly choral services offered by the choirs. 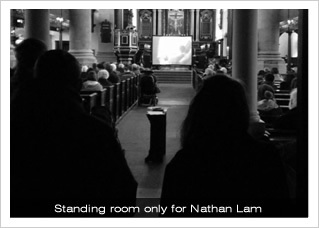 Nathan studies the organ with Anne Marsden Thomas at the Royal College of Organists St Giles Organ School in London. In March 2011, he achieved grade 8 distinctions on the piano, organ and violin and is set to complete his Associateship Diploma with the Royal College of Organists this July. Following his achievement of three A* grades in his A’ level studies, Nathan will take up a much-coveted place to read Medicine at University College London in September; he has also been appointed Organ Scholar at the Grosvenor Chapel. We are particularly delighted to announce that Nathan’s spectacular achievement in the Greater Manchester Marathon raised over £1700, to be shared between the Northamptonshire Music and Performing Arts Trust and the Friends of All Saints’ Music. Later that month, we were delighted to welcome back yet another former chorister from All Saints, JESSICA SMITH. Jessica also owes much to the Northamptonshire Music and Performing Arts Trust, from whom she was awarded a scholarship at the age of 12. She was a member of the Northamptonshire County Choirs for eight years, awarded the Derek Needle and Kingsley Singers vocal awards in 2010, and was a member of the Girls’ Choir at All Saints for four years, during which time she was awarded a Beckett’s and Sargeant’s Scholarship and the position of Head Chorister. by Mahan Esfahani. 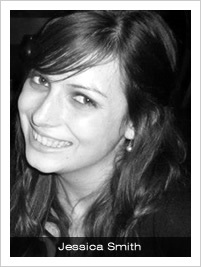 Jessica is a member of Genesis Sixteen, The Sixteen’s prestigious training scheme for young singers. Jessica’s recital included much of the repertoire she was to perform again in her final year recital at Royal Holloway, University of London, where she also held a Choral Scholarship. It offered a brief snapshot of the vast range of fantastic solo song for the soprano voice, moving from a work of haunting beauty by the sixteenth-century English composer and lutenist John Dowland, to Bach, Brahms, Schubert, Messiaen, and Wolf. She concluded the recital with a very contemporary work by Adam Gorb (b. 1958). Scored for solo soprano and tambourine, ‘Wedding Breakfast’ featured incomprehensible vocal lines, voiced shouting, glissandi and cheek-slapping. 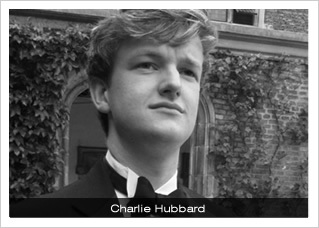 In May we moved back into more familiar territory, with an organ recital by CHARLIE HUBBARD. Charlie started learning the piano with Irene Stanley when he was 8 in his home town of York, and began studying the organ with when he was 15. One of his music teachers at St Peter’s School in York was our own Director of Music, Lee Dunleavy, who was at that time Organ Scholar at the Minster..
Music. Charlie spent his year pre-university as Organ Scholar of Peterborough Cathedral, where as well as his work with the Cathedral Choir, he directed and accompanied the Cathedral Voluntary Choir. Last year he was awarded the diploma of Associateship with the Royal College of Organists. Charlie’s recital offered spectacular works by five of the finest writers for the organ: J.S. Bach, Dietrich Buxtehude, Louis Vierne, Maurice Durufle and Herbert Howells. 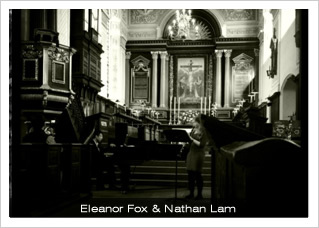 Our final recital in the series featured current member of the Girls’ Choir, ELEANOR FOX, accompanied by outgoing Organ Scholar, NATHAN LAM. Performing a programme of Schumann, Finzi, and Poulence, the young musicians played with great maturity and it was wonderful to get the opportunity to hear yet another solo instrument in the acoustic of All Saints. Eleanor recently won several categories in the Northampton Young Musicians competition, sponsored by the Northampton Rotary Club. Eleanor went forward to represent Northampton in the district finals, performing on both clarinet (Solo Instrumental Section) and in her vocal quartet, The Treble Makers, where she performs alongside Holly Donaghue, another chorister from the Girls’ Choir, her brother Alistair, who is a bass choral scholar at All saints, and James Coe. Eleanor is just going into her final year at Northampton High School, and has been in the Girls’ Choir of All Saints for a year, following in the footsteps of her youngest brother, Matthew, who has been a treble in the Boys’ Choir for some years now. See the news item on The Treble Makers for more information. The formal programme of Young Artists’ Platform recitals, in conjunction with NMPAT, will begin in September.